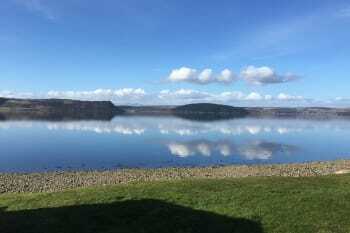 Beach Cottage B&B is located on the shores of the Moray Firth 6 miles from Inverness City Centre offering accommodation with stunning sea views. 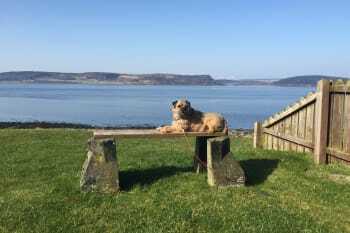 The B&B is owned and run by Brad Norris and his Border Terrier dog, Branston. 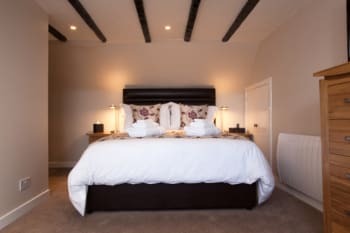 The B&B is an old cottage which has been extended and refurbished to a high standard with two en suite rooms, the Moray and the Beauly. 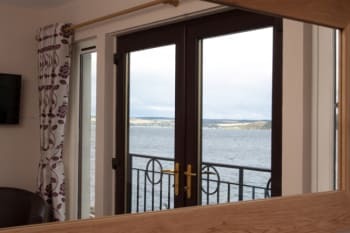 Moray is in the new part of the cottage and has french doors with a Juliet balcony and offers panoramic views of the Moray Firth from Inverness to the South West around to Fort George and Chanonry Point to the North East. Beauly is in the old part of the cottage and offers similar views but they can be seen from the comfort of seats in the bay window. The cottage is in a semi-rural location with no access to public transport so travelling with a car is essential. There are no rooms available at Beach Cottage B&B for these dates. Janey is a wonderful hostess,nothing is too much trouble. very attentive and a warm friendly welcome. lots to do within the local area-you will need a car. RSPB reserves at Nairn +wonderful beaches . Plenty of Waders in at the moment. Eating out locally The snow goose has plenty of choice and atmospheric whereas the Cawdor tavern was lifeless. The breakfasts were excellent, and Janey was a very friendly and welcoming hostess. The Snow Goose has very good food and visiting the battlefield is a must. We visited nearby Fort George and really enjoyed it. I do not think you would find a more engaging host than Janey. The house was immaculate, sitting alongside the sea, so views were so impressive. Food was very good and superbly presented, even the gales did not dampen our experience. Fort George and Culloden nearby are a must. As for evening meals, we drove up to Cawdor Tavern who have a good varied menu and excellent selection of beers, in a friendly atmosphere. Wonderful waterfront B & B! Great accommodations and excellent breakfast. Jenny was a delightful host and helpful with local attractions. We had a fantastic stay of 4 nights at the Beach Cottage B&B. Janet and Monty (of course) are realy wonderful and friendly hosts. Everything was nice, clean and every detail was made with love. The view out of the room was awesome and the personal made breakfast delicious. Janeys Cottage was our first B&B on our trip, and she set the bar very high. At the end, no other B&B was able to reach it. Thank you Janey (and Monty ;-) )! Beautiful location. Host very knowledgeable about the local area and gave useful advice on local sites. Great breakfast. Janey was the perfect host! Her home is beautiful and the views are amazing. Culloden Battle Field is close by and Inverness is just 15 minutes away. The owner Janey is very lovely and helpful, the B&B location is outside in front of the bay and the view is great. We’re hoping to come back some day!! What a lovely b&b this is. A beautiful spot, with an unbelievable view. A great breakfast and a kind and generous hostess. We will be back someday. We drove up the Moray coast. Absolutely beautiful. Awesome location set way off the main drag and situated right on the water. The hostess was very friendly and accommodating. Breakfast was excellent. Will highly recommend. My only complaint was the tight stairwell. Dragging luggage up it is a little challenging. 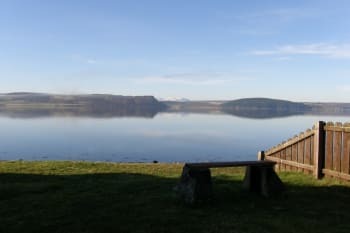 Staying at the Beach Cottage sets you in a perfect location to see the Culloden Battlefield, Clava Cairns, and halfway between the airport and the main city of Inverness. I recommend eating at the Cheese Pantry just up the road as well for lunch. Friendly and helpful host. Beautiful view from room (Moray). Attention to detail and cleanliness was excellent. Breakfast was delicious! Recommend local pub/restaurant Cawdor Tavern at Cawdor. Its good to stay there with a own car, because the B+B is in the bay and not in the city. The indian restaurant was a good tip and we drive to Findhorn and see seals, which play in the sea. Nice and wonderful. Thank you very much for your lovely review. It was a pleasure having you here and good fun playing Kniffel. I don’t think I’ll be entering into any competitions just yet though! Janey and Monty were wonderful hosts. We thoroughly enjoyed our stay of 2 nights. 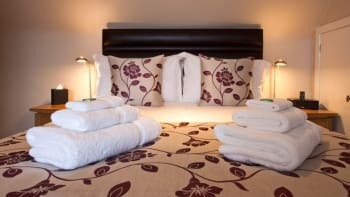 Comfortable beds, beautiful room, delicious food and warm welcome. Would definitely stay here again. It is 3.4 miles from Inverness, but the ambiance is well worth it. Thank you very much, Janey! Our stay at Beach Cottage was an absolute highlight for us. We would come back again and again. Enjoys it! Beach Cottage is Great! We stayed with Janey at the Beach Cottage B&B for our honeymoon and can’t say enough great things about our stay. She made sure we had a truly memorable experience during our time at the B&B. I would highly recommend that people stay at the Beach Cottage. Thanks Janey! Thank you very much for your review. It was lovely to meet you and we’re delighted that you enjoyed your stay. Stayed for 2 nights while up visiting friends in the area. A beautiful location, and a lovely cottage with fabulous hosts. BEST scrammbled eggs EVER! We have traveled across Europe staying at a variety of B&B, hotels (Hilton), and Beach Cottage was our favourite over the course of these 7 weeks. Gail did an amazing job ensuring our breakfast was made to order. Both Janey & Gail worked efficiently to ensure our stay met our expectations. I felt as though I've known them for a long time. We weren't just treated as a guest, we felt like family. Definitely visit Urqhart Castle. Looking for a sweater made in Scotland? check out Johnstons at Elgin. They have a mill on site and you don't HAVE to spend a lot for a good sweater. We didn't have time for a tour of the mill but found the sweaters we were looking for. Fantastic host, location and room. Will definitely go back. Very friendly and lovely hostess. Breakfast is divine and views from the bed/bedroom just bequtiful, peaceful and quiet! Thank you!!! Enjoy and relax. Lots of restaurant, the host will recommend froendly and affordble restaurants. Stunning location by the Firth. Peaceful and private in a seemingly remote location but is only 15 min from central Inverness. B & B cottage has two rooms available. We stayed in Beauly & the view from our bay window was superb. The low ceiling in shower was no problem! Our host Janey was very friendly & made us feel most welcome. Our only regret is we didn't stay longer! A nice place to chill out. Very close to Culloden Battlefield. Afterwards make sure to visit the Clava Cairns & the nearby viaduct. Urquhart Castle & Loch Ness are on the other side of Inverness. Between B&B and Inverness there is a shopping centre with Tesco, fuel & cafes. The most accommodating and generous host yet. And say hi to Monty, the adorable chocolate labrador. The Beach Cottage BnB is one of my now favourite BnBs. The location and the views from the Moray room are absolutely stunning. I wished I could have stayed longer and just sit and watch put on the water. Janey is a great host, making you welcome and Gill makes the best Porridge! Nairn east beach is close by and Culloden. Both worth a visit. 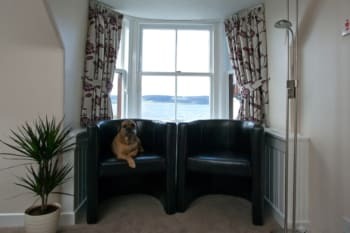 We stayed in the Beauly room that was very comfortable with a sitting area to view the Moray Firth. The entire property was impeccably clean, warm and inviting - this is a lovely place to stay and relax. The view is simply gorgeous. Janey was a warm and welcoming host and nothing was too much trouble. Breakfast is served in the dining room, and was substantial and of excellent quality - simply delicious. Very conveniently located near the airport, the city and other local attractions. Would highly recommend and would stay here again next time we visit Inverness. We have placed a favourable review on Tripadvisor. Enjoy the beautiful view. Culloden Battlefields. Fort George. Nairn. Beauty and the Muir of Old. Inverness Castle. Number 27 Restaurant in Inverness. Thank you Janey for a lovely, relaxing few days. Our room was very clean and welcoming. The view is wonderful. Breakfast was everything we could wish for. We would love to visit again. Fantastic location for a Bed and Breakfast. Janey is very accommodating and nothing is too much trouble for her. The room was very comfortable with the fantastic addition of a fridge in the room. Thank you so much for a brilliant stay. You will definitely need a car to stay here as it’s off the beaten track (trust me that is a good thing). We had a great stay at the Beach Cottage. The location worked well as we had things planned in both the Northern Highlands as well as toward Nairn. Janey was a wonderful host! Wonderful place to relax and go for a walk on the beach. Excellent view from our room. Many things to do in this area and only minutes from Inverness. A well-located up-to-date facility with a friendly owner and excellent breakfast. The rooms are smallish but very well appointed. The location is excellent for visiting Culloden, Cawdor Castle, and is just outside Inverness. Beautiful place in a lovely location everything is to a high standard. Great breakfast .Jeney the owner is a lovely lady and makes you feel very welcome.thank you for a lovely stay. Thank you for such a lovely and memorable stay. The room was gorgeous, the breakfast delicious and accommodating with great variety, and the host extremely friendly and personable. This B & B only added to our wonderful two days in and around Inverness. Loch Ness river cruise through Jacobite tours was great! Highly recommend! The Castle Tavern in inverness is a great dinner spot with lovely views and friendly staff. What may I say?? You have to stay at Beach Cottage so you can see how lovely and welcoming is the place and the staff. The dog, Monty, too!! We had a wonderful stay at the Beach Cottage. We rented both rooms (there were four of us) and both rooms were terrific. One had better views of the water but it should be evident which one in the pictures. Wonderful place to stay. Breakfast was amazing too. Both Janey and Gail were terrific. We had such a lovely time and will definitely return if/when we return to Scotland. We loved Janey's recommendation of The Cawdor Tavern for dinner. It was amazing and the village of Cawdor is so nice. Of course, Culloden Battlefield and Clava Cairns are a must. We wished we had checked out the area around Nairn but ran out of time. This is a lovely stay! Our room had doors that opened so we could see and hear the water! Peaceful place but easy access to roads and Inverness by car. The hostess, Jeanne, is delightful. Warm, welcoming and friendly. Breakfasts were fresh, plentiful and made to order. You can have a great selection. Very strongly recommend this place! The location right on the water is unbeatable. And we had the best breakfasts of our trip there. Stunning location - high quality accommodation - quiet and secluded but still convenient for town and shops. We enjoyed our stay very much. A wonderful quiet place, incredible views and good service. Thank you Janey! Janey - thank you is not enough. We greatly appreciate your hospitality and beautiful accommodations. We had a fantastic stay and that is all because of you. Jeanne was a lovely host! Gail cooked an excellent breakfast! The location and view we're beautiful. Rooms are large, beautiful and comfortable. And Monty the dog was a treat. I would highly recommend the Beach Cottage. We went on the favorite boat tour, just the hour one, and loved it. We also went to Comarty on Black Isle which was beautiful. We ate at the Cawdor Tavern at Jeanne's recommendation and it was FABULOUS! Janey is a wonderful hostess and made us most welcome. The B&B is well placed for visiting local attractions. 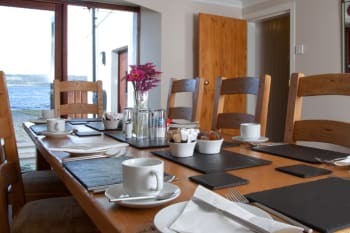 The Culloden Moor inn serves great food and plenty of it at a reasonable price and is only about a 10 minute drive away. Cawdor Castle does not open until May though! It was just a perfect stay! Thank you very much Janey (and Gaile)! The house and the surroundings are beautiful, breakfast is just excellent and we had great fun, chatting and laughing together. Don't go to 'The Mustard Seed' Restaurant! Service is poor, food and wines nothing special and even tough we had a reservation the offered table was bad. Try instead the 'River House' Restaurant - but you definitely need a reservation and you must be fond of fish and seafood. And listen to Janey's recommendations. Janey is such a star! Wonderful host and I loved her Cottage! The view is amazing and you can watch the seaside while lying in bed! Breakfast was great and you can explore the area by car quite easily, or have some Relaxing walks on the shore! Janey was so hospitable and welcoming! The house was very charming and super comfy. Janey had a wonderful dinner recommendation and breakfast at the house was great! This B&B is located a short drive from Inverness but is a world apart. The setting is romantic, beautiful, relaxing and simply the best place to stay. We stayed for two nights and will return. The breakfasts were deliciously prepared with several cold and hot options. The owner is delightful and very helpful with recommendations and made reservations for us for the Loch Ness Boat tour and. The restaurants/pubs she recommended were excellent choices. If you want to stay in a most unique place with beautiful views and sunsets outside your window, then this is the place to stay. Take a boat tour on the Loch Ness, Timotin Whisky Distillery, and any recommendations for dinner that is recommended are excellent. There is much to do and see in the area. Janey is a wonderful, very friendly host! The food was excellent with a wide choice. The room was quite comfortable with a great view. The cottage is in a private, country setting close to Inverness and to the area attractions. Janey has great recommendations for places to eat. The Cawdor Tavern was very good. The woolens shop at Cawdor Castle is worth a visit, as are the Castle itself and the grounds. Their nine hole golf course is fun for a diversion. The Culloden Battlefield is very well interpreted through the audio guide and the visitor center. Wonderful stay, stunning location, and the best host we could have had. Will definitely be back. Considering Janey had only just bought Beach cottage 4 nights before we arrived she did remarkably well. She is a lovely person and the breakfasts were amazing. So much choice. She couldn't do enough for us. The room was very quaint but had everything you needed and super clean. She was always doing something whenever you came back. Good luck and well done. Plenty of choice in Inverness especially alongside the river which is a short ride. There is also an adequate pub next to the retail park which had a large supermarket, cinema etc about 5 mins ride away. Amazing views and very comfortable and clean. We saw seals from the house and dolphins at Chanonry Point. 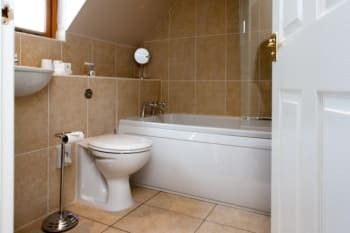 A lovely B & B situated in a stunning part of Inverness. From the moment we arrived until the moment we left nothing was too much trouble. Our Host Brad was attentive, always willing to advise us on local amenities that he thought we might like. He keeps the B & B immaculate and we enjoyed our stay immensely. The room was exactly as pictured on the website, clean and very comfortable. The views are just breath taking and we would definitely love to return in the future. Thank you Brad and Branston for such a fabulous trip I hope the new owners are as great as you. Cawdor Tavern served lovely food, the fresh fruit pavlova was amazing!!! Chanonary Point - This was approximately 30 minute drive from the B & B. Parking can be an issue so arrive early but it is worth visiting as Dolphins swim through here daily. This was the highlight of our visit as they come so close to the shore. Will definitely be back in the future. A great place to your feet up for a couple days, close enough to many attractions. The owner referred me to Ness Tours for an escorted tour of a number of distilleries - high recommended. See Culloden battlefield exhibit, recommend doing some pre-reading on the historical context for England and Scotland. Emplacement exceptionnel, confort de très grande qualité, hôte très sympathique et de très bon conseil. Une adresse à retenir! The owner and his dog are very friendly. Breakfast was cooked to order and was delicious. The room is very clean. Would definitely come back. You do need a car to get to the city center. Excelent B&B!! I loved the view, the decoration, the cleanliness. I enjoied my stay, and I really recomend it! A great view from our room and located away from the crowd. The rooms were very nice, the food was delicious and varied and Brad was a very nice host. We will stay here should we visit the Inverness area again. Our stay at the Beach Cottage was fabulous. Perfect location, cozy rooms and dedicated attention to detail made it a pleasure. Breakfast was wonderful, and would highly recommend. Yet another fabulous weekend spent at Beach Cottage with Bradley and Branston. Bradley is a very good host,paying particular attention to detail and entertaining us with his stories making us feel welcome and relaxed. Branston we miss your wee face already. Looking forward to our next visit. Bradley recommended Ozzie's restaurant and it didnt fail to please. The food and staff were excellent, well worth a visit. On a visit to Chanonry Point we saw some dolphins just off shore. The scenery around the Loch Ness area is spectacular and not to be missed. I wish I could rate higher than a 5. Everything about Beach Cottage B&B is first-rate. 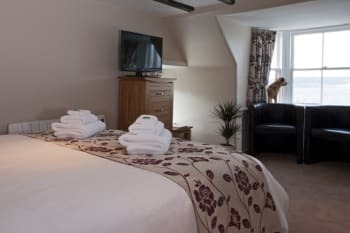 The room is immaculate and comfortable, the location is as scenic as it gets, the host (and his pooch) are informative and accommodating, the food is delicious. Inverness is amazing. Wonderful Visitors' Center and tour of Culloden Battlefield, Fort George, castles galore, excellent restaurants in the historic city center. The best stay we had on our 8 night trip around Scotland. We could not have asked for better facilities or hosts (includes the dog Branston). Castle tavern in front of Edinburgh Castle. Glenmorangie distillery about one hour north of Inverness. Ask the host for any suggestions as he had many excellent ones for us! Beach Cottage is a beautiful B&B. We always had a very good breakfast with many choices. Branston is a great little joy to see in the morning, especially when we were missing our fur kid back home. Brad, you are a fantastic host, thank you! We enjoyed our stay very much and will be back again! Great place for dinner is the Culloden Moor Inn and don't miss going to the Culloden Battlefield! Everything about Beach Cottage is excellent - the situation, the comfort and cleanliness of the room, the food and Brad is an exceptional host. Hire a car and see as much of this wonderful area as possible. Would recommend a visit to see the reindeer herd and take a ride on the funicular railway just outside Aviemore. Beach Cottage B&B is the best accommodation we have ever had the pleasure of staying at. 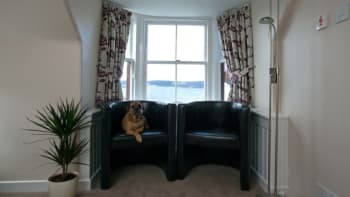 The views out to the Moray Firth and the Black Isle are breathtaking, and the warmth of the host Brad and his gorgeous Dog Branston is something we found very hard to leave when our holiday came to an end. We will 100% be coming back to Inverness to stay at the Beach Cottage again! 10/10! Loch Ness, Inverness city, Cairngorm national park, aviemore and the reindeer trail were amazing, and Cawdor Tavern was a lovely place to eat with scrummy well cooked food! Amazing rooms, views and Brad and his dog Branston were so welcoming and friendly. Branston always had a paw to offer and Brad had a great story to tell. Wish we could have stayed longer. It was the first two days of our honeymoon and there is nowhere else we would rather have stayed. A beautiful place with a wonder host. Even though only ten minutes from the city centre you would think you were a million miles away. So peaceful. So perfect. What a great place to stay. Only problem was that we couldn't be there for longer. Brad runs a wonderful and comfortable B&B. The breakfast was the best we had on our tour of Scotland. The view is stunning. Branston is a great little guy who likes a fun pretend scrap and was at the bottom of the stairs to greet us in the morning. Thanks Brad. We will be back as soon as we can. Lovely location, beautiful room, friendly staff, strong wifi, professional, wonderful breakfast!! Perfect location for both airport convenience and a vacation, with easy access to both the city center and surrounding countryside. Right on the water, with a view from the bed was wonderful. Our host was incredibly helpful and friendly and the breakfast is outstanding. One of the most comfortable beds on our vacation! Dinner at the Cawdor Tavern at Cawdor Castle was wonderful, the rack of lamb special in particular and a perfect atmosphere for our last night in Scotland. The Culloden Battefield is very close and well worth a visit, and a nice walk. Well done on achieving such high standards. Beach Cottage B&B suited my needs perfectly. I would have no hesitation in returning. Your host will provide all the info you need to know about the local areas including places to find good food. The location is fairly isolated but fantastic if your intention is to get away from from built up areas; and therefore having your own transport is a basic requirement. Otherwise a taxi to Inverness will set you back in the region of £20 (one way). The standard of the accommodation is excellent, the location for me was perfect. Beach Cottage is a wonderful place to stay! 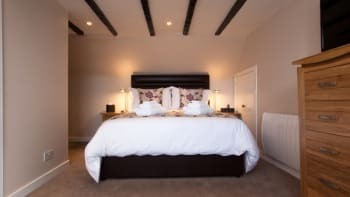 It is right on the edge of the Moray Firth with stunning views of The Black Isle - very peaceful and great views, yet only a short drive to Inverness. The room we stayed in was very comfortable and everything we needed was there. Brad is a great host - super breakfasts - nothing is too much trouble. It is one of the best B&Bs we have ever stayed in. Culloden is a few miles away - a great half-day trip. Good shops in Inverness if you are after Scottish gifts and souvenirs. The Cawdor Tavern serves excellent food and drinks - about 20 minutes easy drive away. There are lots of good restaurants in Inverness and Brad is happy to make suggestions. Genuine, friendly yet professional, well-organised and good attention to detail. Overall had a very enjoyable stay, thanks Brad! Cawdor Tavern as recommended by Brad was a beauty - friendly, good quality and a wonderful sense of history. Cawdor Castle is well worth a look too - a wonderful mix of original features and modern living adaptations, with a very good cafe attached, and stunning gardens. Bradley and Branston the border terrier keep a very clean place (seriously, not a speck of dust, dirt, or dog hair anywhere) and the breakfast was very tasty! The location is peaceful and serene, right on the water (lovely sunset! ), yet very conveniently located to Inverness, Culloden Battlefield, and Tesco. We would definitely consider staying here again. A visit to the Cawdor Inn restaurant for dinner is a must. A lovely, quiet space, with outstanding views of the Firth. Brad was an awesome host and a lot of fun. Great breakfast and VERY clean! Be sure to go see the Cawdor castle. We didn't know about it, and didn't see it, but heard great things. The Cawdor Tavern was great! Best place to eat without question is Cawdor Tavern. Recommend to book though. Very amiable hosts; excellent breakfast; pleasant and comfortable room with beautiful view on the beach. Very helpful hosts to plan trips and dining. Warm welcome and high level of comfort, cleanliness! I strongly recommend this cottage. Bradley has a lovely B&B and he does a splendid job with breakfast and adds wonderful little extras both in the room and at the breakfast table. Well done, Brad! Brad suggested a couple of restaurants...we tried Cawdor Tavern on our last night - delicious food, friendly service. We wished we would have tried it on our first night as we all agreed we would have gone back. No visit to Inverness would be complete without a cruise on Loch Ness...we used Jacobite, and had a lovely time. a very nice place. quiet, secluded location near inverness. Everything was excellent and perfect for a nice quiet place to stay while using Inverness as a base to explore the Highlands. No complaints and would stay again. Go to Culloden and take a flight with the Highland Aviation School and would recommend Hoots and the Mustard Seed but don't bother with Victorian Market. We had two very good dinners, one at the Cawdor Tavern next door to the Cawdor Castle and one at the Mustard Seed in Inverness itself. We would recommend both. We would recommend a boat ride on Loch Ness to Urquart Castle. Also, drive around the entire lake and stop for some walks. The scenery is beautiful. Another brilliant couple of days at Beach Cottage. Great room, fantastic views, brilliant host and superb breakfasts! Try Cafe1 in Inverness for a meal, and go dolphin watching with Ecoventures from Cromarty. Absolutely fantastic! Beautiful rooms. Spectacular views. Amazing host Bradley who is great with local restaurant help and advice on days out. His breakfast is to die for. Safe parking too. A most gracious and courtious host. Excellent accomodation with outstanding scenery. The BED was excellent I actually slept. We had an enjoyable stay at Beach Cottage. Bradley is a very good host and engaging character. The cottage is out of town in a lovely location overlooking the Moray Firth. The rooms are beautifully kept and scrupulously clean. All and all a very good value for money B&B. The attention to detail is second to none given by Brad assisted by the lovely Branston his dog. We thoroughly enjoyed our stay nothing is too much trouble. The view over the water from the Beauly room is amazing. See the Dolphins at Chanonry Point and walk along the beach. Very friendly and welcoming, beautiful room with great views. Culloden exhibition is excellent. We liked visiting Fort George. We had a meal at Culloden House Hotel. Beautiful venue, great food and service. Enjoyable stay, peaceful scenery. Loved Brads sidekick, Branston. Delicious breakfast spread. Attention to detail, amazing. Helpful host. Good value. Ask Brad for info, if he doesn't know, he'll find out for you. Excellent, Brad and Branston are perfect hosts i would highley recommend staying at beach cottage. Location is convenient for travel in the Highlands and the view is spectacular. Brad is an very attentive and responsive host. Would highly recommend to anyone traveling in and around Inverness. We couldn't fault our stay, very friendly, helpful and welcoming from both the owner, Branston and the locals! amazing location and we miss it already. Breakfast was very good and plenty of choice. The room and facilities was perfect and made us feel confident , relaxed and at home . This weekend away was just what we needed ! B&B bien placé au calme. Accueil chaleureux. Tout était parfait ! Great B&B on the shore of Moray Firth. Will be recommending to others! We had a fantastic stay with Brad at Beach cottage. Perfect location, fantastic host and couldnt have felt more welcome. Even Branston the dog was playful and fun! Room was exceptionally clean and breakfast was in abundance! Brad gave some great recommendations on places to visit so we made the most of a short stay in the area. Overall great visit in a beautiful location. The Dorres Inn on the outskirts of Loch Ness serves great food right beside the water. You can also visit the 'Nessie Hunter' here and pick up some handmade goodies! Bradley and Bronson the dog are fantastic hosts rooms have spectacular views and are the cleanest rooms I've stayed in. A very warm and hospitable welcome throughout our stay. The B&B was very comfortable, warm and cosy for our new year break. The views from the cottage from all rooms were spectacular. Breakfast was great, great quality and plenty of options. We hope to visit again in the future. A great base for exploring the highlands, Inverness, Aviemore & the Cairngorms all easily accessible by car as well as lots of old traditional Scottish hamlets. Discovered Cullen Skink a traditional Scottish smoked haddock, potato, leek and cream soup!! Some great places to eat in inverness, but will need to drive there or get a taxi. Superb location, high quality facilities and rooms, owner brad is a top class host and nothing is too much trouble. Rooms are finished to a superb standard and the cleanliness of the house is superb. River house restaurant a must to dine at. Fantastic B&B with excellent views of the sea. The room was very clean and cosy. Would recommend to anyone. Very nice stay, but one day seems to be too short! We would definitely love to come back over here (preferably in summer I think). Very clean and tidy. Amazing location, the view from the room is breathtaking! Highly recommended for a cosy night with your loved one! Ask Brad the owner, he is a superb guide too! Lovely cottage, views are gorgeous! We had a lovely warm welcome from Brad and his very friendly dog Branston and the breakfast was delicious! exactly as trip adviser had said - spotless, comfortable, beautiful location and good breakfast. We took advice and had dinner at cawder tavern - first class. Trato muy excelente durante toda nuestra estancia, Habitacion perfecta , desayuno perfecto y la calidez humana del dueño y su perro nos encanto. A wonderful accomodation to stay, for having trips to the city of Inverness or the near landsape. Highly recommended!! Having stayed for 2 nights, we would highly recommend Beach Cottage. The property is immaculate yet homely. We appreciated Bradley's attention to detail with regards the quality of everything supplied in the room and the breakfast ingredients and choice. Loved our stay at Beach Cottage B&B & would throughly recommend & hopefully stay again one day. Brad's attention to detail is exceptional and we were made to feel very welcome and his breakfasts are rather yummy too. If able to try and make the trip round the head land in the morning to catch the Dolphins when they come into feed at tide change. Brad will know the times. Magically experience. Shin Falls is worth a visit for the walk around the woods and depending on time of year watch the salmon leaping back up stream. Ticket to Ride bikes are great in Inverness if wanting to hire bikes, we had a lovely ride around the Caledonian canal. Vary friendly owner (Bradley). One of if not the best B&B we have stayed at. Brad was very help full giving us ideas of where we should go and see while in Inverness. Breakfast were great. Highly recommend this B&B. Just ask Brad where to eat. A drive to Dunrobin Castle is a absolute must and make sure to stay and see the falconer with his falcons in action on the castle grounds, which are beautiful. Brad is a very kind host and always helpful in any way. We can recommend the local Restaurants Cawdor Tavern as well as the Mustard Seed. Wonderful location! Exactly as portrayed on website. Fantastic view of the sunset. Great area to explore. Loved your recommended restaurant. Easy to visit Inverness or beach at Nairn. Cawdor tavern was wonderful suggestion. Thanks so much! Brilliant location, superb breakfast, very friendly. Beach cottage is one of the most beautiful locations I have stayed in. The cottage itself is lovely, welcoming and homely. Brad, the host, is a great guy, very friendly and gave us great local information about places to go and things to see. 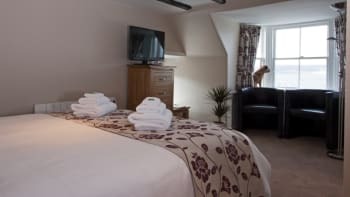 The room we stayed in was beauly, it's a very cozy and keeps the traditional style of a Victorian cottage but with the latest technology to insure the maximum comfort. The bed is unbelievably comfortable, the shower strong and well lighted while the view leaves you speechless. Breakfast was a huge choice of bought self service and cooked breakfast and Brad really knows his stuff :) All in all we would recomand it to everybody and we look forward to staying with Brad and his wonderful cuddly and hilarious dog Branson ! Thanks Brad for your disponibility and great humour! Best B&B ever! We absolutely loved everything: the rooms, the view (! ), the cleanness, breakfast and of course Bradley and his very cute dog Branston! Thank you very much for a wonderful stay! We thoroughly enjoyed our 2 nights at Beach Cottage. Excellent location and the room was very comfortable and clean. Bradley went out of his way to make us feel welcome. Would definitely recommend Beach cottage to other travellers. A great b&b in a beautiful, quiet spot. Lovely views over the Moray Firth from the Beauly room. Great attention to detail and a warm welcome from Brad who was extremely informative about the area. 2 very good restaurants: the Mustard Seed in Inverness (good value early evening menu) and Cawdor Tavern. My wife and I had a superb 4 night stay at Beach Cottage. Every aspect of the stay was perfect. It was clean, comfortable, well situated with a superb breakfast. We couldn't have asked for more. Brad (and Branston) made us feel extremely welcome and his local knowledge and recommendations enhanced our trip. I have absolutely no problem recommending Beach Cottage B&B and plan to stay there again on my next visit to the area. Culloden Battlefield is well worth a visit. Book a tour of Loch Ness but make sure it includes the stop off at Urquhart castle. Ask Brad about the best time to view the local dolphins as they feed on the local salmon. A great location, with super views. Will definitely be booking again when up in the Inverness area. We had a wonderful stay at the Beach Cottage B&B thanks to Bradley and lovely Brenston. Everything was absolutely perfect. Thanks a lot. Not only the accommodation and location were just perfect, we also felt very welcome by Brad and Branston. Brad gave us a lot of good tipps. We enjoyed our stay tremendously. Thank you. Have dinner at Cawdor Tavern. It is only a short drive from the B&B. Wow, what an amazing place. The room was not only spotless and with all the amenities one would expect but beautiful. Well designed and elegant with an amazing view of the Firth (we saw dolphins on our first morning!!) Brad was an amazing host, very helpful and friendly. All of his recommendations for dinner and things to do in the area were great! Breakfast was amazing. This is an amazing place in a beautiful location run by a wonderful man. Great place right by the beach with amazing views on the bay. Friendly welcome by both host and his cute dog, great breakfasts and helpful tipps from our hosts. Thanks for the great stay. The Cawdor tavern nearby is a great place to eat and have a drink. A car is strongly recommended. And don't forget your camera. Beach Cottage is in an idyllic location overlooking the Moray Firth. The room we stayed in called Moray overlooked the Moray Firth and to see that lovely view every morning was something not to be missed. The owner Bradley was extremely likeable and friendly and nothing was too much trouble for him. Bradley and his dog Branston are a winning combination. We had a great holiday and really enjoyed our first visit to Scotland - I'm sure it will not be our last. While we were stopping at Beach Cottage we went to Loch Ness, Kyle of Lochalsh and Balmoral Castle - all well worth a visit. Also there are some lovely walks along the river in Inverness. Me and my husband are more pub grub people so I cannot recommend any fine dining places, but we were more than happy with the nearby Snow Goose, one of the Vintage Inns chain, which we visited twice during our stay. All was perfect and we have specially appreciate that the dolphin show was included. We had a friendly welcome from Brad and Branston the border terrier. 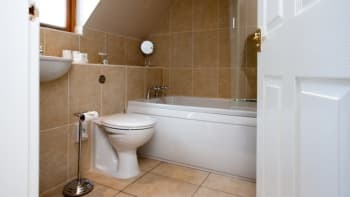 The room and en suite bathroom were beautifully appointed and cared for. Lots of breakfast choice. We had a wonderful few days. We were in the area to watch the dolphins at Chanonry Point and they were there with the incoming tide a few metres from the shore. We also visited the boat festival at Portsoy which has a charming old harbour. If you plan to eat in Inverness on a Saturday night it is wise to book. Brad has lots of advice. Make sure you take some time to just sit and look out of the window of your room or sit outside with a glass of wine. It is a very calm and charming place to be. Amazing stay. Mother & daughter enjoying special trip and Beach Cottage fulfilled all of our expectations and more! Thank you Brad and Branston! Brad couldn't have made us feel more welcome. He had lists of advice on what to go and do, places to eat. The room was looking over the sea which was a lovely view. Very quiet spot. Breakfast was a varied choice, would highly recommend Scottish breakfast. Would certainly return. Go to the Black Isle to view the dolphins when there feeding. Crawdor castle and gardens are worth a visit as is the Tavern in the village for a meal. Plenty to do and see, we didn't have enough time to do everything. A wonderful b&b in a fabulous location. Bradley and Branson are very welcoming and friendly. Bradley is very knowledgeable about the area which was really good and as a result I have two wonderful evening meals and saw dolphins. Listen to Bradley's advice on where to eat. If you don't kind a drive the 50 mile trip north to dunrobin castle is very worthwhile. 100% perfect. A great stay. Brad and branston are so nice. Perfect Service. Many thanks. Room with the great Windows. Spotless B&B right on the Moray Firth coast with wonderful views across to the Black Isle. Very comfortable bed and lovely cooked Scottish breakfast. Make a trip over to the black isle!!! Our host, Bradley, was lovely, and made our visit exceptional. Branston, the dog, was adorable. Everything was immaculate, and breakfast was excellent. I would give Beach Cottage an A+ as a place to stay. We had a perfect stay from start to finish. Bradley and Branston were brilliant hosts. The breakfast choices were fantastic. Our well equipped room was wonderful with amazing views. Both bedroom and bathroom were spotlessly clean. It was a perfect base for our golfing holiday.The only downside was not being able to stay for longer than four nights. We hope to be back and it deserves 5 stars and a 10 out of 10. Fine location, lovely rooms and great attention to detail throughout. A warm welcome and excellent breakfast. Don't blink or you'll miss the breakfast dolphin. Dinner at the nearby Cawdor Tavern is excellent. Very nice B & B - good location and very friendly owner. The breakfast was exceptional and he tried his best to make our stay as comfortable as possible. Very nice. We enjoyed visiting local sites around Inverness - particularly nearby castles and the countryside. We hired a driver for one day and he took us all over northern Scotland and to Skye. It was a great day to learn local history and relax with someone else providing all of the details and driving! 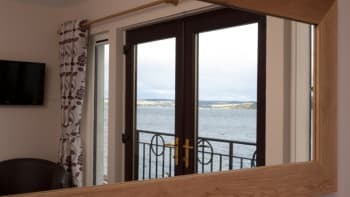 The Beach Cottage was a very centrally located "home base" and the view of Moray Firth beautiful. It's close to a grocery store and several eating establishments. Easy to access with a car (we rented one for our trip) and quiet at night. Excellent stay. Brilliant hosting. Can't fault anything. We stayed 2 nights with Brad & Branston at the beach cottage , the setting is fantastic right on the beach with a view across the Moray Firth to the Black Isle. 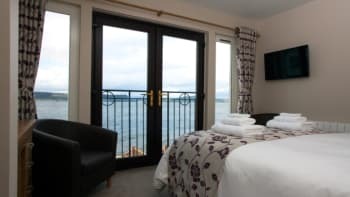 Brad & Branston are great to stay with so friendly & welcoming & the rooms are beautiful , you can lay in bed & look out across the water & if you`re lucky you may get a glimpse of the dolphins. We would definitely stay again. You are just outside of Inverness & Brad will no doubt advise you of all the best restaurants & places to sightsee. Very clean, wonderful view. Great host. Arrive at 2 to make the most of the view, very handy for Inverness and Nairn. What a lovely location, great B&B, everything you could wish for. Brad and Branston the wonder dog were perfect hosts at this lovely B&B situated right on the Moray Firth. 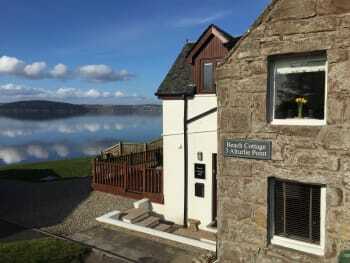 We stayed for 3 nights and found Beach Cottage to be a perfect location for visiting the local attractions and Inverness, with its lovely shops and eateries, is a very short distance away, along with beautiful Loch Ness. The room was meticulous and had lovely views over the Firth. Brad has thought of everything to make your stay comfortable including the use of free WiFi which is so handy when you're a long way from home. Breakfast was amazing with a huge selection to choose from. Brad makes the best scrambled eggs!, Brad's dog Branston is an important part of staying at Beach Cottage and he makes great breakfast company along with Brad's converstaion and sense of humour. We thoroughly enjoyed our stay. My recent stay at Beach Cottage was lovely. My room was perfect as were the wonderful breakfasts each morning. A quiet and restful place to recharge. The owner is friendly and quite a gracious host---- and Branston---what can I say except precious! Cawdor Tavern nearby is a really good place for food and drink. The Cawdor Castle and gardens outstanding. There are also walking trails beyond the gardens into the big woods with the most beautiful sight and sounds one can imagine. This is a place to relax and chill out,for eating the city of Inverness is a short drive. Loved it! So relaxing and soothing, wish we could go back. 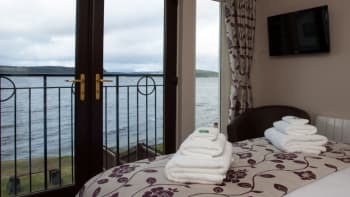 The location is spectacular; the accommodation tastefully decorated and everything you could want for available in the room, down to the binoculars! Go for an invigorating walk by the beach to feel the wind in your hair and smell the sea - wonderful! The Cawdor Tavern was great for an evening meal too. Loved our stay at Beach Cottage B&B. It was so lovely to wake up to the amazing view in the morning. The host was delightful (as was Branston the dog). The bed was so comfortable and the room was beautifully decorated and everything was so clean. Breakfast was amazing as well. We would certainly stay again. Easy drive to the Loch Ness and the town of Inverness from this location. We arrived and left by train and rented a car to do the small bit of driving to the local attractions. Once we checked out of the B&B, we were able to leave our luggage at the train station lockers for a small fee, and then walked all over the town until our train left later in the day. Very nice small "hotel" don't stay in Inverness if you've got a Car! Everything was great! Take your car and have dinner at the local Crawdy Tavern that is fabelous. Andrew and his dog are very very kind. Andrew is thoughtfull. Great B&B ! We had a wonderful stay and felt very comfortable. We would like to come back. We can highly recommend the Beach Cottage B & B. Brad is an attentive host and his breakfast just amazing. The rooms are beautifully decorated and clean. For us one of the best. Bay view. Talking with Brad. Eating in Cavdor. Très bon bed and breakfast ! Idéalement situé, au calme, avec une très jolie vue ! Nous avons été très contents de l'accueil gentil et serviable, de la chambre jolie et très propre et du petit déjeuner écossais très bon ! Tout était parfait ! Seul petit reproche, la douche très basse de plafond. Thanks Bradley for your beautifully presented accommodation. We will always remember the soothing ocean view from our room and your cute wee dog Branston. Very handy to Culloden Battle Field Visitor Centre which we found highly informative and interestingly laid out. Great location by the water, stylish hotel-quality rooms, furnishings, facilities, bathroom and linens. Everything was spotlessly clean and the breakfast served was excellent with lots of choice. 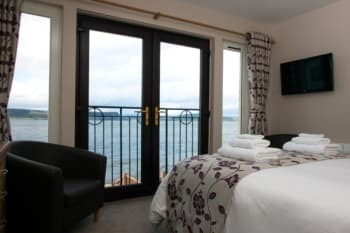 Very friendly welcome and fantastic sea views from the rooms. The Cawdor Tavern - very good restaurant and service. Very pleasant B&B if you are looking for a relaxing and romantic place to stay. Really warm welcome and really nice host. I will definitely recommend this B&B! Try to choose the sea view if available! Excellent location - was made to feel very welcome. I will not hesitate to book again in future. We loved it and will definitely be back! Thank you so much! We were not only impressed with the perfection of the location, rooms, views, breakfast and overall service.....but the added value of such a friendly and decent host. Thank you Brad and of course Branston for making our stay so memorable. 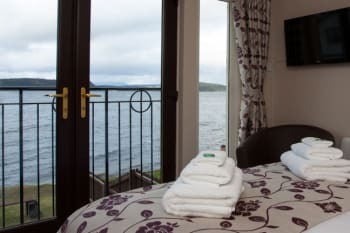 We would recommend the Dores Inn on Loch Ness for a superb meal and view of the Loch. 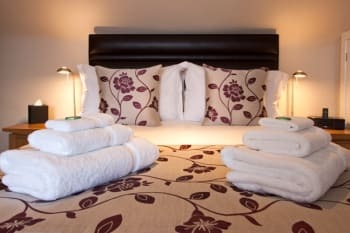 Absolutely loved our stay,would highly recommend the accommodation,the vry comfy bed was a dream,the room was superb,the view was beautiful.Bradley was a fantastic host,we were made vry welcome&very well looked after during our stay.breakfast was superb,lots of lovely options to choose from,very high standards&attention to detail.the location was superb,you felt you was miles away from anywhere yet the centre of inverness is only a 10min drive. Lovely place to stay, will certainly stay again! An amazing stay....thanks Bradley for your hospitality...we also loved Branston's company too! The rooms were very well appointed with modern furnishing! The breakfast was also lovely and refreshing! Friendly and welcoming. Wonderful location and views, with everything we needed. Great breakfast. Thanks so much for the room, it was perfect and we wanted to stay one more night at least! The view is amazing. All perfect really! highly recommended, beautiful place to stay in every respect, very convenient for inverness and the airport. Very nice room with a view of the sea. The owner is very hospital (and so is his dog) The bed is very comfortable. Breakfast is very good. Only problem I had was the low ceiling in the bathroom. I couldn't stand beneath the showerhead. We ate at restaurant The Kitchen in Inverness. I would definately recommend it. Had a lovely stay. We were only there one night but it was wonderful. Room was very lovely and cozy and the views were great. Had a nice stroll along the beach. It was really nice to stay somewhere quite and serene but that was just outside the city. Would love to go again! We really enjoyed our stay and have already recommended the facility to others. The Cawdor Tavern was really good. Bradley,you wre an excellent host! Your recommendation for the Tavern was perfect. Excellent B&B, maintained to the highest standard, superb views over Moray Firth . Bradley was a perfect and caring host with the addition of Branston his loving dog was an added bonus. 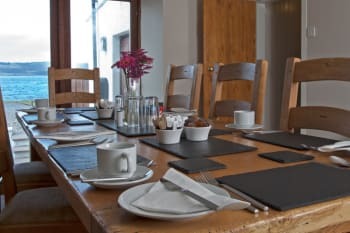 My stay at Beach Cottage was a delightful experience and the breakfast was exceptional with a fine selection which catered for everyone's needs. Bradley was the Perfect host and strives on perfection and succeeded in making my stay complete. Highly recommended. A super B & B - the cleanest place we've ever stayed. Bradley (and Branston) were wonderful hosts and the cooked breakfast each morning first class. Ten minutes from Inverness itself. Culloden close by. Wonderful views of the hills and snow-capped peaks, although too late to see any seals or dolphins. Rarely recommend anywhere but this is the exception! The location is beautiful and the cottage itself warm, cozy and inviting. Lovely place to stay for a relaxing weekend away. Relatively isolated so a car is required (or taxis) to get to Inverness and surrounding areas but not too far as to be a problem. The owner has lots of Information on local restaurants and is more than happy to advise places to go!! Cawdor Tavern. Nearby local Pub Restaurant with excellent food and good ambience. !st Class is all that needs to be said. Wonderful place! Wonderful view! Funny 'Branston' (dog of the house) and a charming owner! We absolutely loved Bradley and Branston! They were the most courteous hosts--they went above and beyond on just about everything. Great food and great help. Cawdor Tavern has amazing food & ales--a bit off the beaten path, but definitely worth a visit! Clava Cairns is also a great sight to see if you are in the Culloden Moor/Battlefield area. Tall folks (6'+) may not want to book the Beauly, low shower. Fantastic view, fantastic cottage, the owner is really friendly and nice, the breakfast was excellent! Beach Cottage in Inverness is such a lovely place to stay. We enjoyed every second of our stay. The breakfast was so delicious, especially the freshly prepared Fruit salad and the scottish breakfast. The host is so friendly and has really good tips what things to See and to do (dolphin watching!!!!). Beach Cottage was definetly the best bed and breakfast during our stay in Scotland! Dolphin watching!!!! Ask the host for best times and locations to see wild dolphins for free! This is the second time we have stayed at Beach Cottage. For us, everything is perfect and we find it such a relaxing place to stay at the end of our trips to Scotland. The location, just a few miles out of Inverness, is fantastic. Bradley, the host, is so welcoming and friendly. His cooking skills are awesome too - breakfast is lovely. The room is beautifully decorated with everything you need. A huge thumbs up from us. We would recommend it to all looking to stay here. Best B&B we had in Scotland! Friendly, clean and comfortable, ample breakfasts. Good place to stay for the highlands, close enough to city centre, but nicely far enough away for you to feel totally in the middle on nowhere. Fantastic location, brilliant host, tasty breakfast. We had a great time. We saw dolphins, a seal and an Otter one breakfast time. Nothing was too much trouble for Bradley. Will be recommending it to all my friends. Had very tasty evening meal at The Snow Goose. Would recommend booking as it gets very busy. Only 5 minutes away towards Inverness. We enjoyed our three night stay at Beach Cottage especially the breakfasts which were substantial and well presented. 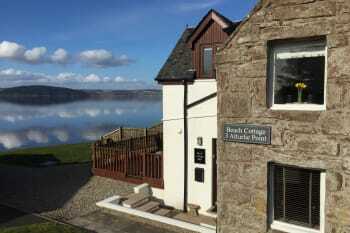 The standard and cleanliness of the accommodation was superb and we would not hesitate to recommend Beach cottage to anyone looking for accommodation near Inverness. We spent a very interesting morning at the Culloden visitors centre. Great welcome, beautiful room, very convenient for visiting Inverness. Particularly appreciated info re tide times - we were at Chanonry Point on time to see a really good dolphin display!! many thanks. Try the Afternoon tea at the coffee shop at the entrance to Cawdor Castle. Beautifully presented and good cooking. This is a 4 star accomodation which should be 5 star. Thoroughly recommended. Plenty to see and do in the area and plenty of places to eat. Dunrobin Castle with falconry is worth seeing just one hour dirve at north coast. Tomatin Distillery is a must for all visitors as well as the culloden battlefields. Best B&B we ever had in Scotland. Perfect!!! The room + bathroom was clean, to ever time. Spectacular view from the window over Moray Firth. Very quiet and pure nature (we saw the otter in front of the B&B, nice to see). Breakfast was very excellent, great choice, every morning. Brad, the guest father, was lovely, helpful and friendly. We will come back, to stay in Beach Cottage B&B. Perfect room / location / host / view!!! Our trip was enjoyable thanks to you. your home, your humor and your kindness. thank you again, we hope to return soon. The location is perfect base for touring north / south / west, and the view is so beautiful. The house is more than clean and very quiet. that was a great pleasure. Thanks again. Distilleries are not far away. You can have a boat tour on the Lock Ness (20 mn from there). Inverness is good to see, there are plenty of good restaurants (Mustard seed, reverside, the corner...) and walks around the river Ness. And another very good restaurant the Dores Inn in Dores by the Lock Ness. It's a really good base point to go west / south / north. We spent 2 nights in the Beach Cottage and are thrilled. A perfect room with a great view and a service that you will not find in some good hotel. We have received many great tips from the owner Brad, but the real boss in the house is the crazy dog ;-). We'll be back next year definitely go back and look and the tranquility and the perfect service at the Beach Cottage. Thank you for 2 great days! Excellent position with beautiful views over the firth. Beautiful breakfast in an untra clean home with excellent facilities. One of our favourite stays in UK. We missed the otters and seals that frequent the area, but we missed them on a sea-safari, also due to the late summer. Easy to find if directions are followed. SAT Nav takes you to the door. It was a pleasure staying with you Brad (and Branston!). We hope to see you again before too long. Beautiful location, lovely room, tastefully decorated, friendly owner. We also enjoyed meeting Branston. Good hospitality and very nice, clean, warm, comfortable room; the only notable omission was a wardrobe. Car park layout a bit awkward. Do not miss visiting Fort George! Welcoming, warm, friendly. One of the best B&B in Inverness. Great host, very knowledgeable, helpful about local tourist sight and routes to get there. A great place to stay. Attentive service and everything you could possibly need to hand. A superb ,idyllic location. Stunning views. What a fantastic place to stay! Beautiful location,Freindly host, Immaculate accomodation and only short drive to centre of Inverness. Loved it all! Placed à review on tripadvisor..
the location is absolutly amazing but it was very difficult to reach it because there is no sign neither about location nor the resort. A great b and b, everything done well. This is ideal for a relaxing quiet break,very clean and finished to a good standard.lovely breakfast to get the day started. Fresh milk in room would make great use of the in room fridge. waking up to that view is worth the money alone. The stay in Beach Cottage was just wunderfull. Bradley was very nice, helped to find a good restaurant for dinner and served in the morning an excellent breakfast. Would come again any time. Very nice and warm hospitality and the owner personally cares about the well-being of his guests! About 10 minutes outside of Inverness. Must need to have a car! However, very nice and quite location.